The industrial revolution is a thoroughly documented subject in world history. The topic is expansive due to the fact that the industrial revolution first began in Great Britain in the 18th century and slowly spread to every corner of the world over the span of hundreds of years. As a result, countless books have been published on the topic analyzing it from almost every angle. With so many to choose from, it can be hard to know where to start. That’s why I’ve compiled a list of some of the best books on the subject. These books discuss many different aspects of the topic. Some of the books give a more global perspective while others focus exclusively on specific countries, such as Britain or the United States, or on specific issues in the industrial revolution like economic issues or social issues. 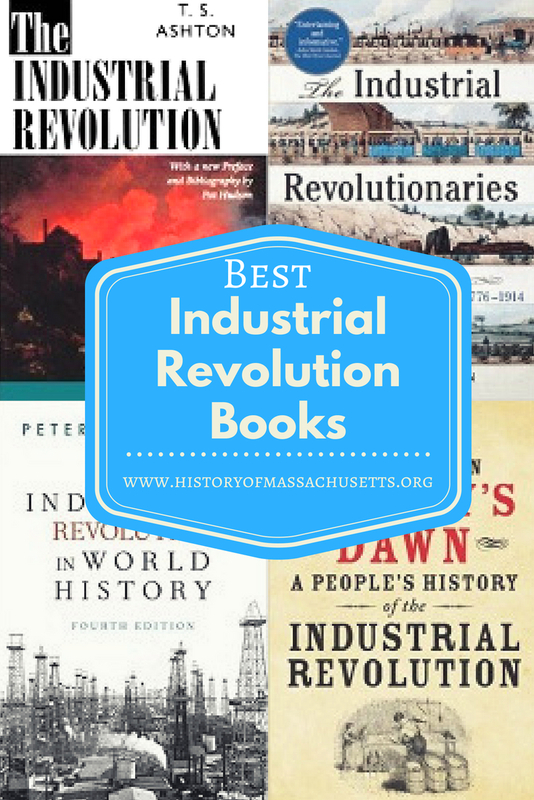 These books mentioned here are also some of the best-selling books on the industrial revolution and not only received great reviews from literary critics and historians but also have great reviews from readers on sites like Amazon, Goodreads and etc. Published in 2010, this book discusses the scientific breakthroughs that led to the invention of the steam engine. Rosen argues that the idea of intellectual property, particularly the patenting of ideas, led to the invention of the steam engine and a series of other inventions that fueled the industrial revolution. Rosen explains that the patenting of ideas incentivized the everyday man, not just wealthy elites, to produce many new and innovative ideas with the goal of profiting off of them. In doing so, Rosen states this was a pivotal moment in human productivity and it essentially improved all aspects of life, such as food, shelter, transportation, medicine and etc, thus allowing the population to grow and thrive in a way it never did before. Rosen, who died in 2016, worked as an editor and publisher at Macmillion, Simon and Schuster and the Free Press for 25 years before becoming an author. Rosen wrote numerous books about history and science including Justinian’s Flea: The First Great Plague and the End of the Roman Empire as well as The Third Horseman: A Story of Weather, War, and the Famine History Forgot. Published in 2013, this book discusses the affect the industrial revolution had on workers and challenges the notion that it was grim, inhumane and exploitative as many previous historians have suggested. Griffin found in her research that these workers rarely pined for the long-gone days of rural farm life and found that opportunities for working men were far better in the days of the industrial revolution than they had been in the past. Griffin did find though that the opportunities for women were harder to assess because women were often discouraged from telling their own stories. As a result, fewer autobiographies and memoirs written by women were published. What Griffin did discover was that most working women in her sample of stories eventually left the workforce to become mothers and only returned to work if they began having significant financial problems due to major life changes, such as widowhood. Griffin is a historian of modern Britain at the University of East Anglia and has a PhD from Cambridge University. In 2001, her PhD was awarded the Prince Consort and Thirlwall Prize, a prize awarded exclusively for essays about British history. Griffin has written numerous books about history such as A Short History of the Industrial Revolution; Blood Sport: Hunting in Britain Since 1906; and England’s Revelry: A History of Popular Sports and Pastimes, 1660-1830. In 2007, Griffin won the Lord Aberdare Prize for Literary History for her book Blood Sport. Published in 2014, this book chronicles how America surpassed Britain’s manufacturing industry and became a manufacturing superpower during the Industrial Revolution. The book discusses how American entrepreneurs adopted Britain’s mass production models but instead of using them exclusively for textile manufacturing, as the British did, they applied them to every aspect of the American manufacturing industry. Morris argues that America then became an economic superpower in the 1840s and 50s when the American railroad system finally connected the Northeast and the Midwest. This allowed regional industries, such as Midwest mining, lumber and food processing and New England manufacturing, to grow and expand so much so that it finally surpassed Britain’s manufacturing industry after the American Civil War. Charles R. Morris is a lawyer, former banker and author of many books about the economy and history, such as The Tycoons: How Andrew Carnegie, John D. Rockefeller, Jay Gould, and J.P. Morgan Invented the American Supereconomy and The Two Trillion Meltdown: Easy Money, High Rollers, and the Great Credit Crash. Originally published in 1968, this updated version of Eric Hobsbawm’s best-selling book chronicles the course of the industrial revolution for over 250 years, measuring its impact on society and politics along the way. The book describes how Britain became an industrial giant during this time period but eventually lost its leading role in the industrial revolution. Hobsbawn goes on to explain how Britain’s industrial decline affected its citizens as well as the country’s relationship with the rest of the world. Although the focus of the book is Britain’s role in the industrial revolution, it is essentially a history of Britain and its role in the world economy. Eric Hobsbawn, who died in 2012, was a British Marxist historian who earned a PhD from the University of Cambridge and served as the President of Birkbeck University from 2002 until his death. Hobsbawn wrote many books about the rise of the industrial revolution, socialism and nationalism in the 19th century, including The Age of Revolution: Europe 1789–1848, The Age of Capital: 1848–1875 and The Age of Empire: 1875–1914, The Age of Extremes. In 2003, Hobsbawn won the Balzan Prize for European History. Published in 2007, this book discusses the entrepreneurs and inventors who transformed the modern world. The book argues that the many innovations of the era was rarely the work of one individual and was more the work of many people across the world sharing and building upon each other’s ideas. Weightman states that the real revolutionaries of the era were the people who actually took the ideas and theories of the time, either their own or someone else’s, and put them into practice, bringing these many inventions to life. Gavin Weightman is a journalist and documentary filmmaker who focuses on social history since the 18th century. Weightman has written many books about this time period such as The Making of Modern London; the Frozen Water Trade; and Signor Marconi’s Magic Box. Originally published in 1993, this book discusses the impact the industrial revolution had on world history over the past three centuries and how it is still affecting us in the modern day. The book details the international factors that kick started industrialization and explores its global spread and impact. Stearns argues that the industrial revolution was the “most important single development in human history over the past three centuries” and it was a global phenomenon that happened in three waves: first in western Europe and the United States in the 1770s, then in Russia, Japan, Canada and Australia in the 1880s and then finally in the Pacific Rim, Turkey, India, Brazil and other parts of Latin America in the 1960s and onward. The book was recently updated and is now in its fourth edition. Many user reviews of the book, on sites like Goodreads and Amazon, suggest that it is more of a broad history and basic introduction to the topic but that it is perfect for beginners who are new to the subject because it is simple and easy to read. Stearns has a doctorate in history from Harvard University and is currently a history professor at George Mason University. He has written and edited over 135 books on social and world history including the Civil War in Global Perspective; Globalization in World History; and Debating the Industrial Revolution. Published in 2009, this book explores why the industrial revolution began in 18th century Britain instead of somewhere else like Asia or continental Europe. Allen argues that the reason for this is the inventions of the industrial revolution were more profitable to invent and use in Britain than in other countries due to the high wages and cheaper energy costs there. Allen states that his explanation for the industrial revolution differs from most others because others tend to focus on the social structure, property rights, science and cultural aspects of the revolution, which Allen feels does not really apply or explain the industrial revolution at all. The book was well received by critics, particularly economists who appreciated its focus on the role the economy had in the industrial revolution. Some readers, on sites like Goodreads and Amazon, argue that the book is a little light on the politics of industrialization and, despite its title, doesn’t offer much in the way of a truly global perspective. Robert Allen is a professor of Economic History at Oxford University and a fellow at Nuffield College. Allen has written a number of books on economic history, such as Farm to Factory: A Re-interpretation of the Soviet Industrial Revolution; and Global Economic History: A Very Short Introduction. Originally published in 1948, this book discusses how the industrial revolution completely transformed British society in the span of only 150 years. The book argues that although the industrial revolution is often portrayed as a catastrophic event that led to environmental problems, harsh working conditions and child labor. Ashton believes it was also an important turning point that greatly improved the quality of life of British people as well as created many economic rewards and stimulated intellectual ingenuity. The book suggests that the progress brought about by industrialization greatly outweighs any negative impact it may have had. T.S. Ashton, who died in 1968, was a British economic historian who taught economic history at the London School of Economics and the University of London. Ashton wrote numerous books about economic history such as Iron and Steel in the Industrial Revolution; An Economic History of England: the Eighteenth Century; and Economic Fluctuations in England 1700–1800. The Industrial Revolution 1760-1830 is considered Ashton’s best work on the topic. Originally published in 1969, this book discusses the inventions and technological advances that fueled the industrial revolution in Western Europe beginning in the 18th century. The book explores why Europe was the first to industrialize and argues that industrialization is just one part of a larger process of modernization during which a culture significantly changes its social order, institutional order, attitudes, values, and government in order to promote and accommodate further change. In addition, the book also discusses the economic boom that has occurred since the industrial revolution began and argues that only through continued industrialization can the world sustain itself economically in the coming years. The book is considered by many to be one of the most significant books on the economic history of industrialization in Western Europe. David S. Landes, who died in 2013, was a history and economics professor at Harvard University where he earned his PhD in 1953. Landes wrote numerous books about economic history such as The Wealth of Poverty of Nations: Why Some Are So Rich and Some So Poor; The Invention of Enterprise: Entrepreneurship from Ancient Mesopotamia to Modern Times; and Revolution In Time: Clocks and the Making of the Modern World. Recently, I was discussing the American Industrial Revolution with my (very bright) 12 year old granddaughter. She’s in 6th Grade. What would you recommend for her. She’s reading above grade level – gets all ‘A’s. Thank you. I don’t know much about books for kids or young adults but perhaps The Industrial Revolution in World History might be a good book for her because many readers say it’s more of a general history on the topic and is a good book for beginners.